Herbert (Bert) Kendall, circa spring 1915, outside the Heath and Reach Weslyan church, Bedfordshire. George Thomas Clarke Kendall (Herbert's father, left). George was born in Orton, Northamptonshire to Charlotte Dorcas Kendall, later Pinnock (who passed away on the 3rd February 1899) and an unrecorded father. George started his working life as a farm labourer in Orton, near Rothwell before he found work in the growing shoe industry in Kettering, working as a 'Shoe Presser' and later a 'Bussman Shoe trader'. By 1901 he was the owner of The Woolpack Inn, 4 Horse Market, Kettering (now called Henry's). George owned several properties in the town, living in 56 Russell Street in Kettering - fifty yards from the Stonemasons Herbert worked at - where he remained until his death on the 28th January 1927. He was 71 (the same age his wife was when she passed) and is buried in the Kettering cemetery, next to his mother and eldest son. Martha Annie Kendall (Herbert's mother, left). Martha was born in Kettering, the daughter of Samuel Roughton - a prominent local musician, who's statue can still be seen in Kettering today. Martha died Saturday 19th March 1932 aged 71, and was buried with her husband the day before the 14th anniversary of their second son's death in France. Harry Norton Kendall (Herbert's brother, middle of group photograph). Harry was born 4th December 1882, the eldest Kendall boy! He lived at 56 Russell Street in Kettering from sometime after the Great War until his death in 1945. Harry was buried alongside Charlotte (his Grandmother) and next to his parents, 30 years to the day that Herbert was operated on in Egypt following his wound on Gallipoli, and Harry's descendants lived in the same house until recently. 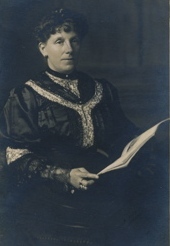 His widow, Eleanor Ellen Kendall lived until December 1971, when she was buried with him, aged 89. 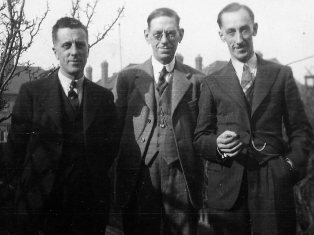 John (Jack) Roughton Kendall (Herbert's brother, left side of group photograph). Jack was born around December 1885. The third son, he married Georgina Brewer from Hertfordshire and worked as an Engineer before, during (at Rolls Royce) and after the war. Their son, Maurice Kendall became one of the most prominent Statisticians of his time, writing 'Kendall's advanced theory of Statistics' amongst many other titles, which was revised many times and is still used as a core text even today. In 1974 Maurice was knighted and six years later received the Peace Medal for his work on the world fertility survey. William (Will) Thomas Kendall (Herbert's brother, right side of group photograph). Will was born 2nd March 1899 and was conscripted into the army in April 1917, once he reached service age. He served as Private G/25909 with the 10th battalion, the Queens Regiment and survived the war despite being wounded. He was demobilised in January 1919 and returned to civilian life. By 1932 he was married to Lou and lived in Sutton but I have not traced him definitively beyond there, although it appears he worked in hospitals after the war and moved to South Wales at some stage. Ernest George Kendall (Herbert's brother,left). Ernest was born 25th April 1887 in Kettering, and worked as a barber in his early working life until he went to America in June 1909. He returned to England and married Mabel Helen Driver in Kettering late in 1910. The couple lived in King's Norton, Birmingham initially, where they had their sons John Roughton Kendall (named after Ernest's brother) in 1911 and Ivan Kendall in 1913. Ernest returned to America in 1914 and his family followed in August 1915. In June 1917 Ernest enlisted into the American Army who had joined the war but did not serve abroad. They lived in Newburgh, New York, where Ernest worked for the Underwood Typewriter Company. By 1930 they owned their home and Ernest was a Commercial Traveller for the same firm. In WW2 Ernest was again drafted, at which time he lived in New Jersey and the couple passed away in 1970, in Florida. By 1901 Herbert was a 'Stone Cutter', later a 'Stonemason' and eventually a 'Stonemason Journeyman' who worked for Cox's Stonemasons (who are still on St. Peters Avenue in Kettering today). His brother Jack was a noted amateur performer and actor and Herbert himself enjoyed performing light opera, notably Gilbert and Sullivan. Whether they performed together or not is open to speculation! Despite the distance from her home, his future wife worked "in service" for a vicar in Kettering, where it would appear they met. 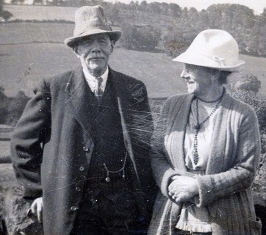 On 11th September 1909, Herbert married Ellen Elizabeth Hack (pictured left around 1930, long after Herbert's death in action) from Heath (now called Heath and Reach), near Leighton Buzzard in Bedfordshire. They married in the Heath Parish Church, where Herbert is standing in front of with three of his children in the top picture. Annie Elizabeth Kendall (my Grandmother, pictured left in June 1954 after her only son had returned from the Korean War). Annie was born 3rd March 1910. Although some documents record her birth at Lanes End, Heath and Reach, Leighton Buzzard, Bedfordshire, it is possible that she was born in Eastbourne, Sussex, probably whilst her father was working there as a Stonemason Journeyman. She lived in Linslade and Leighton Buzzard her entire life and died 19th February 1981 at Rothschild Road, Linslade, Leighton Buzzard, Bedfordshire, aged 70. She is the eldest child, on the right, on the photo at the top of the page. Hilda Georgina Kendall was born 9th October 1911 at No. 2 Clifton Villas, Cromwell Road, Cold Ash, Newbury, Berkshire, probably whilst her father worked in the area. Hilda survived a childhood attack of Meningitis and lived her life in Leighton Buzzard and Great Brickhill areas of Bedfordshire and Buckinghamshire. She can be seen on the left in the photo at the top of the page. Herbert George Kendall, born 20th December 1913 in Heath and Reach and died 22nd December 2003 outside the Leighton Buzzard library in Bedfordshire, aged 90. 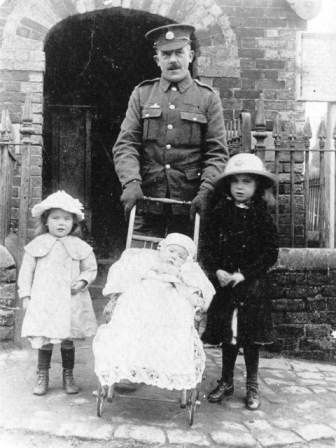 George as he was known, is the baby in the pram in the photo at the top of the page and lived much of his life in Linslade, Bedfordshire. Evelyn Kendall was born 13th December 1915 (the same birth date as my daughters) and died 26th October 1975, aged 59. I do not know much about Evelyn, although I believe she owned a wool shop in Enfield or North London at some stage in the 1960's or 1970's. Herbert enlisted into the army very early in September 1914, aged almost 31. He went to the newly opened Recruiting Office in Leighton Buzzard and initially served in D Company (Dunstable and Leighton), of the 5th Battalion of The Bedfordshire Regiment. He is shown on the left early in their training, in a group photograph of D Company. Below and to the left as you look appears to be his brother-in-law, Joe Hack, although this is unconfirmed. Once recruitment swelled their ranks, a reserve battalion was formed and, because he was just over the standard age limit for overseas service, Bert was transferred into the 2nd/5th (Reserve) Battalion. In early 1915, the age parameters were changed and Herbert was moved back into the 1st/5th battalion, where would see 3 years of service. The Battalion started its training in Romford, but was stationed at Bury St Edmunds from September 1914 until Easter Monday 1915, after which they marched to Norwich. Following a brief stay there, they marched to St Albans for their final training, and it was whilst stationed here that they conducted their 'Farewell to the County' march in July 1915, before being sent overseas. They sailed from Devonport, Plymouth on Monday 26th July 1915, and Herbert's Medal Index Card shows he entered the war on Tuesday 10th August 1915, landing on the Island of Mudros, the British entry point to the Gallipoli peninsula. Herbert served on Gallipoli in the Machine Gun Section of the 1st/5th Bedfordshire Battalion, 162nd Brigade, 54th Division from September 1914 until wounded in October 1915. The Battalion acquitted themselves with noted gallantry and lost almost 50% of their number in their attack along the Kiretch Tepe Ridge 15th August 1915 but were involved in no other major offensive actions in Gallipoli. From 29th September to 2nd December, the Battalion was posted into the North ANZAC Sector to hold the line opposite Sandbag Ridge and Hill 60. During October 1915 scenes of the bloodiest hand to hand fighting were recorded during repeated night raids on a Turkish outpost in No-Man's Land called 'Bulgar Bluff'. The position fell and was retaken repeatedly over the weeks, during which time Herbert was wounded in the stomach. Battalion strength in the War Diary was recorded as 256 on 31st October, having lost over 800 soldiers since landing in August - less than 200 would be left by the time they were evacuated from the peninsular. On 30th October 1915, Herbert was operated on in No. 5 Canadian Stationary Hospital, Cavalry Barracks, Arbassia (Alexandria, Egypt) by Lt-Col. Etherington and returned to his Battalion some months later, after convalescing. 1916 was an uneventful year, spent mostly in rebuilding the shattered Battalion and defending the desert outposts around the Suez Canal. 1917 saw the campaign resume and something around this time appears to have returned Herbert home. Although unspecified, this appears to be an adverse reaction to an operation and could have been the result of an illness, injury or wound. When fit for active service again in January 1918, Herbert was transferred into the Lewis Gun section of the 7th Battalion, The Bedfordshire Regiment of the 54th Brigade, 18th (Eastern) Division in France. He spent a brief period in the dreaded, uncomfortable Houlthulst Forest sector, north of Ypres, during the depth of winter. Within days or a few weeks at the most, his battalion moved from the northern most sector of the line to the southern most sector, as a result of the British army taking over a new part of the Western Front from their French allies. On 21st March 1918, the German army launched a massive offensive against the thin, overstretched line of General Gough's Fifth Army. Herbert and the 7th Battalion were involved in the heavy fighting during the opening phases of "Operation Michael", and stubbornly held the Crozat Canal in the area south of St Quentin, between Mennessis and Jussy. Late in the morning of 23rd March, the ever shrinking 54th Brigade was ordered to fall back onto a ridge east of Faillouel, which they held between 1pm and 4pm. On receiving further withdrawal orders, they were caught in the village by the rampant German forces that had already broken through around Jussy to their north and taken the village, all but destroying the 11th Battalion of the Royal Fusiliers in the process. By the end of 23rd March, the entire Brigade could muster around 400 men from its initial strength of 2,500, but fought on. 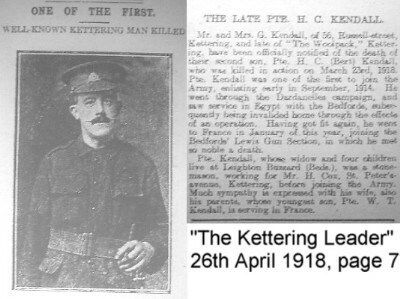 After enduring 3 and a half years of war in 6 different countries, Herbert was killed in action Saturday 23rd March 1918, around Faillouel, as the Bedford's stubbornly fought their way out of German encirclement during the desperate British defence. A full narrative of the battle including maps and photographs of the battlefield today can be seen here. Herbert was 34 years old, and left a wife and 4 children. His Service Papers were destroyed during the Blitz of WW2 and he is one of many thousands of soldiers who has no known grave. He is commemorated on Panels 28 & 29 of the Pozieres Memorial to the Missing of the Fifth Army, the Kettering War Memorial, and is remembered by his Great Grandson every day. Although unconfirmed, I believe he may lie in the Grand Seracourt cemetery, 8km south-west of St. Quentin, as around a quarter of the cemetery appears to be the final resting place of unknown soldiers from the 54th Brigade who were killed in that battle on that day. During his service Herbert earned 3 Campaign Medals; the 1915 Star, Victory Medal and British War Medal, although they were returned when issued, so were never received by his family. The only memento of Herbert that has survived - apart from the photograph - is an Army Issue Field Compass (see below) that found its way to Herbert's Great Grandson (Steve Fuller) in 2005 - 90 years almost to the week after Herbert himself found it amongst the debris on a battlefield in Gallipoli. A few weeks after the 90th anniversary of Herbert's first battle - on the 25th September 2005 and completely out of the blue - I received an email from a man called Lee who claimed to have something that belonged to my Great Grandfather. My heart skipped a beat; it turned out that he had conducted research for a lady who wanted to find out about her ancestor in the Great War and she had given him a few WW1 items in gratitude for his help. Amongst those items was a Compass from the war. He had spent the best part of a year trying to locate a relative of the man who had found it on a battlefield in Gallipoli and written his name on its case. Well, you could have knocked me down with a feather! That Wednesday Lee and myself met up at the National Archives in London and he gave me this most treasured of possessions! Two six foot plus men fawning over a 90 year old compass with tears in their eyes must have looked rather bizarre to onlookers! And there we sat chatting about it, Herbert Kendall, Lieutenant Harding and various other subjects until research called us back to the archives. How the compass made it back to Blighty in one piece and ended up in a barn in Oxfordshire 90 years later we can only guess for the moment, but there seem to be family connections between its original owner and the family who's barn it lurked in for years, with the only other link between Herbert and them being Machine Guns as all three served in Machine gun sections or Corps. Whatever route it took, I can only say I'm very pleased it made its way back! As for the original owner - Lt A.F. Harding - he was wounded in the leg the day Herbert picked his compass up, so I presume he dropped it when wounded, although I have no evidence to support that other than the coincidence of the date. Lieutenant Harding survived the war and led an extremely full life, becoming a decorated Officer in the Machine Gun Corps. By 1918 he was Lt-Colonel with a Military Cross to his credit and died 'Field Marshall', Lord Harding of Petherton' no less, according to p131 of Richard Holmes's book 'Tommy'. Having served alongside my Great Grandfather on Gallipoli and in France in the first war, he served alongside my Grandfather too, in the British Eighth Army who fought in North Africa and Italy in the second war of 1939-45. Although unlikely that he knew either of my ancestors as they would have moved in very different circles, the odds of them all being in the places they were when they were must be quite slim! D Company, 7th Battalion in 1914. A lovely photo of D Company from the 7th Battalion late in 1914 before uniforms were issued to the whole Battalion with some in their 'Kitchener Blues'! These men would have enlisted in August and September 1914 under "K1" and "K2" and were still undergoing basic training at the time. Private and Sergeant 15483, later Lieutenant Lionel HAMBLING, M.C. Lionel Hambling was born on the 18th May 1889 in Thrapston, Northamptonshire. His parents were Alfred John William (a retired financier) and Eliza Fanny Hambling who moved to Plough Cottage, South Mimms by the time Lionel enlisted into the army. Private 15483 L.L. 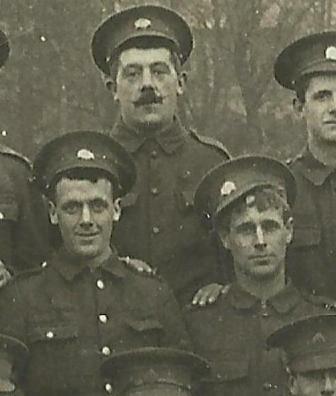 Hambling enlisted on the 7th September 1914 at St. Albans, aged 24 years and 3 months. Trade was shown as a Caterer, who also taught pianoforte harmony. He was posted to the newly raised 7th Battalion and was promoted to Lance Corporal on the 22nd September 1914, to Corporal on the 1st October, finally becoming a Sergeant on the 25th November 1914. After training, Lionel sailed with the 7th Battalion to France in July 1915 and served in the trenches until, on the 18th October 1915, he reported to Battalion HQ complaining of severe abdominal pains, but returned to the trenches the same day. They didn't go away and on the 1st November 1915 he was transferred to the 55th field Ambulance with Appendicitis and Pyrexia, then straight to 5 CCS, arriving at Rouen on the 3rd. Lionel left France on the 15th on board the Hospital Ship "St. Patrick" and spent until the following summer recovering. Once he had recovered and retrained, Lionel was posted back to the 7th Battalion as a Sergeant on the 29th September 1916. By now, he was a qualified Machine Gunner. He joined them just in time to join the assault on the impregnable Schwaben Redoubt near Thiepval, which the 54th Brigade took at considerable cost. After the battle, around 400 of the Battalion were left and they took no further part in offensive operations until after Lionel's departure that December. Lionel impressed his CO with his leadership, resulting in him being recommended for a Commission. He was posted to the Regimental Depot as a Sergeant, arriving in England on the 20th December 1916 and he was posted to No. 3 Officer Cadet Battalion at 70 Woodland Road in Bristol on the 20th March 1917. Once he was trained, Lionel was discharged to the "Special Reserve of Officers" on the 26th June 1917, having been granted a Temporary Commission in the 3rd Battalion. By this time, he had served a total of 2 years and 293 days in the ranks of the Bedfordshire regiment. 2/Lt Lionel Hambling arrived in the 4th Battalion on the 9th September 1917 and was involved in the final big phase of the Third Battle at Ypres ("Passchendaele") when the Division attacked a mile west of the infamous Passchendaele Ridge but were held up by a combination of the mud, enemy artillery and machine gun fire. Almost 200 of the 4th Battalion became casualties on the 30th October and the Canadians eventually took the ridge a week later. After several quiet months holding the lines, the massive German Spring Offensive was launched on the 21st March 1918, which saw the 4th Battalion in the thick of the incredible fighting withdrawal that only just held the onslaught. After a week of fighting and retiring, the Battalion was becoming extremely weak but still refused to be overrun. On the 27th March, during a superbly led stand against a massive German attack, Lionel was among the many Officers who became casualties. Included in the casualty list were the Battalion CO, Lt-Colonel John Stanhope Collings-Wells who was posthumously awarded the Victoria Cross as a result, the second in command Major Nunnelly and a further seven of the handful of Officers left by the 27th. "SUPPLEMENT to THE LONDON GAZETTE, 22nd JUNE, 1918. 7411 2nd Lt. Lionel Hambling, Bedf. R., Spec. Res. For conspicuous gallantry and devotion to duty. He showed great skill and courage in keeping his Lewis guns in action to cover a withdrawal, .and inflicted heavy losses on the enemy. Later, during an enemy attack, he established two Lewis guns in a forward position and put two enemy machine guns out of action." Lionel received a gunshot wound to the forehead and left the 4th Battalion on the 27th March 1918, once they had been relieved. He arrived back in Dover on the 5th April to start another phase of recuperation. On the 11th September 1918, Lionel was deemed fit again and ordered back to the 3rd (Reserve) Battalion to restart training in readiness for his return to the front but by the time he was fit again, the war was thankfully over.